The GasMaster 21900NG high pressure natural gas dryer. It is fully automated, heat reactivated, twin tower desiccant dryer designed to provide dehydration and purification of high pressure natural gas at a maximum stated flow rate of 250 SCFM at 400 psig. The dehydrator is designed to provide high levels of dryness through the use of filters and descant beds. 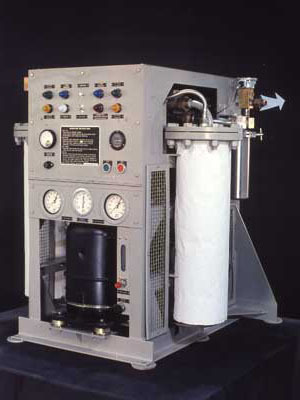 The GasMaster is designed to dry natural gas from an inlet condition of 7 LBS. / MMSCF to 0.5 LBS. / MMSCF ( at a flow and pressure). The unit uses a programmable logic controller to automatically control every function of operation gas path components are made of stainless steel or other corrosion resistant materials. The pressure vessels are designed by ADC to meet ASME pressure vessel code with a safety factor of 4.0. To minimize external support requirements the GasMaster system purge is accomplished with internally controlled dry natural gas	from the main flow downstream from the unit.